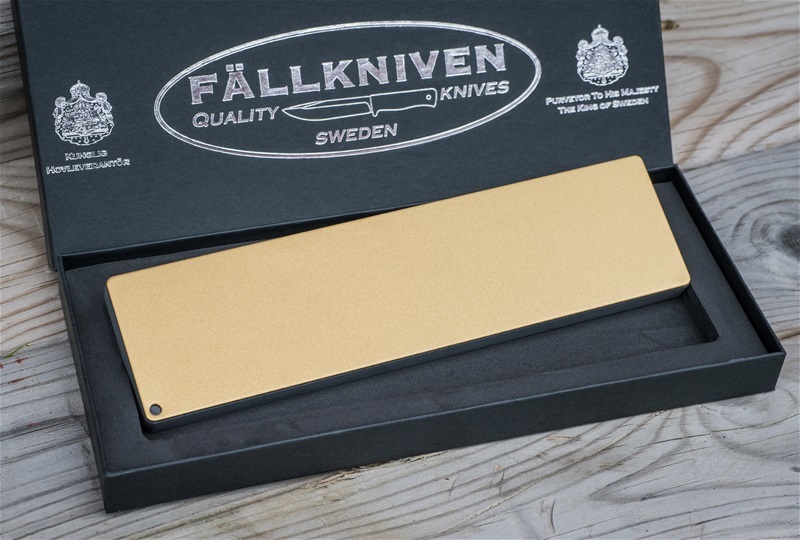 We're pleased to be carrying these sharpening tools from the respected Swedish knife maker, Fallkniven. Their sharpening stones feature durable diamond and ceramic abrasives specifically designed for working with the hard steels found in today's top end knives. The DC521 stone offers a generous 8-1/4" (210mm) x 2-1/4" (55mm) size, making it suitable for almost any knife. This bench stone is double sided, with diamond and ceramic surfaces that will sharpen well and maintain their flatness even when working with the premium steels found in many of today's top shelf knives. Both abrasive surfaces are to be used dry, with no oil or water. Upkeep of this stone is straight forward, with both the diamond and the ceramic sides requiring only an occasional cleaning with soap and water to keep them free of waste material and working optimally. The gold colored side of this stone is covered with 25 micron (about 600 grit) monocrystalline diamonds, then coated in titanium alumina nitride to make a fast cutting, durable sharpening surface. This diamond side is used to quickly restore the shape of your knife's edge. The dark gray side of the stone is a ceramic material composed of synthetic sapphires. Finer than the diamond surface, the ceramic side is used to refine the edge after shaping. Ceramic stones don't have abrasive particles in the traditional sense, so it isn't really practical to apply a grit number to them, but the feel of using the dark ceramic side is similar to using a hard Arkansas stone. It leaves a refined edge with a hint of tooth-iness. Unlike an Arkansas stone, however, the ceramic of this sharpener will cut super hard steels quickly and efficiently.